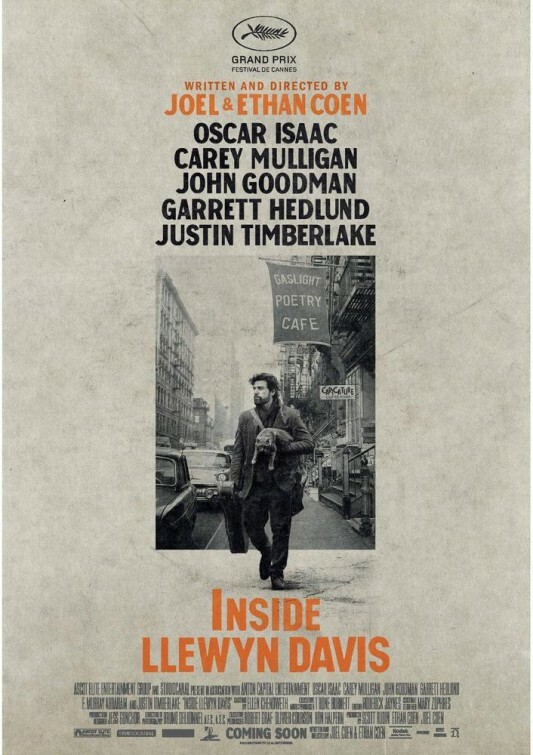 I wish I could write a thoughtful, positive review of the Coen brothers’ latest film “Inside Llewyn Davis”, but to be perfectly honest, I didn’t love it. I appreciate it, and admire its beautiful soundtrack, but I don’t know quite what to make of it. At least I can start on a positive note: Oscar Isaac delivers a terrific performance in the title role. From the opening scene we learn that he is a gifted folk singer and musician struggling to make an impression in 1960’s New York. The movie manages to paint a vivid portrait of life in the city and the Greenwich Village night scene. What’s more, the cinematography, by Bruno Delbonnel, is simply perfect. But while the movie is well crafted and superbly acted all around, I didn’t feel anything when it came to a close. I value the Coen’s eye for detail, especially in a period such as this, and their exceptional gift for casting just the right actors in every role, large and small. There are colorful roles for great actors like John Goodman and F. Murray Abraham, and a surprisingly good performance by Justin Timberlake. But the movie left me confused and vaguely dissatisfied. Perhaps I was looking for resolution, like the poor Llewyn Davis. Seems like we were both out of luck. On the contrary, I was fascinated by the melancholy and nostalgia released by the movie. Coen brother’s made a movie about the difficulty to live with art. Is it autobiographical ? Perhaps, yes. I honestly don’t know what to make of it. I loved the attention to detail and the fantastic (yes fantastic) music. But I felt nothing when it ended. I still admire The Coens.